Macap isn’t yet well known in Indonesia, but this Venetian-based company has already made quite a reputation as a leading manufacturer for high-quality grinders. It has been manufacturing all kinds of grinders since 1930, mainly for the European and United States market, and now I’d like to showcase it for you to consider it as a competitor for other grinders that have already been well-known in Indonesia. 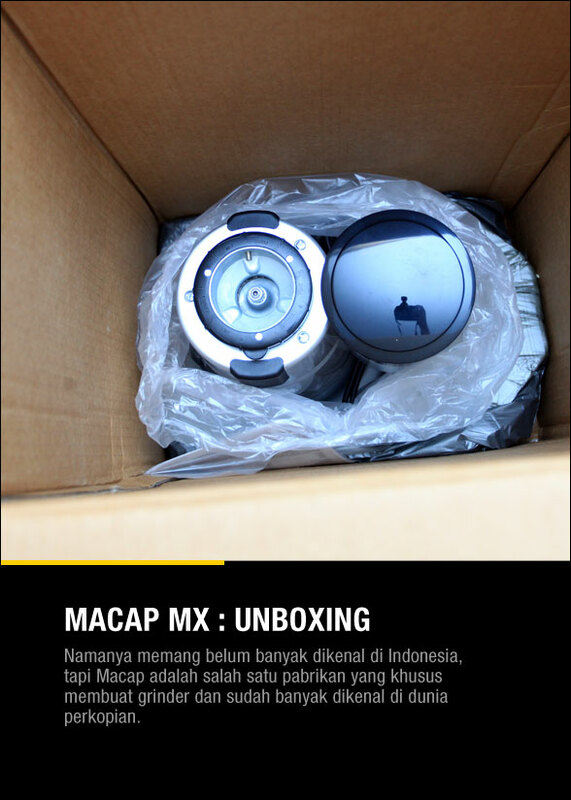 Image 2: Unboxing Macap MX. 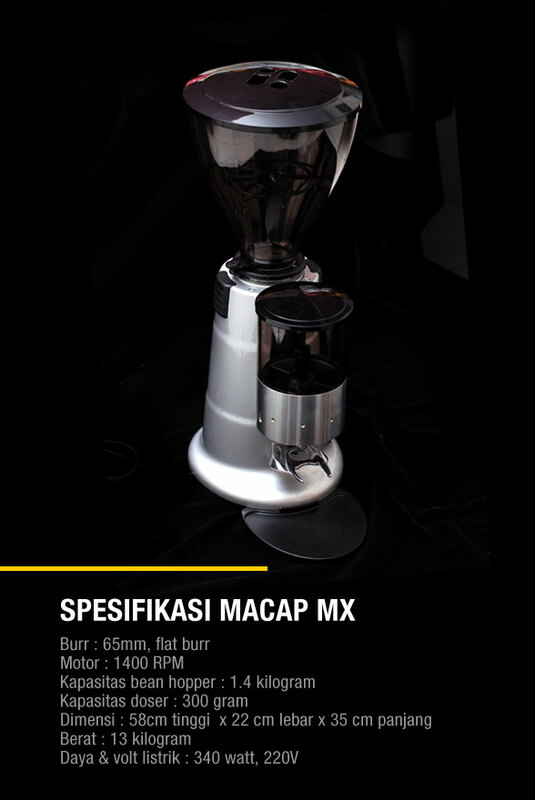 It isn’t yet well-known in Indonesia, but Macap is one of the manufacturers that specializes in making coffee grinders and it’s quite popular in the coffee world. My request to its distributor, PT Sinar Putra Sejahtera to introduce Macap to the Indonesian market has finally been granted – after enduring such a long wait for it to be sent all the way from Italy. 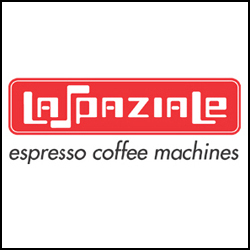 Mind you, my first encounter with Macap two years ago had caught my interest in trying their grinders, amongs them were the rebranded La Spaziale grinder – also known as the Top Grinder. 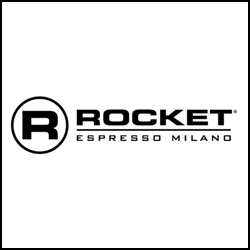 Just like La Spaziale, other espresso machine manufacturer such as Iberittal also rebrands their grinders. My first impression upon unboxing the Macap MX for the first time was that it had already shown its class as a heavy weight grinder with a nett weight of 13 kg. Unfortunately, no manual was attached to this machine on how to operate it, but installing a grinder is hardly rocket science, isn’t it? So let’s unpeel Macap MX’s professional coffee grinder parts – one by one! While unboxing, my eyes when straight to the bean hopper – standing tall (25 cm) at almost half of the grinder’s height itself (58 cm); cone-shaped with a diameter of 23 cm and gleaming in its coffee-colored exterior, the bean hopper accommodates 1.4 kg of coffee beans, and it’s equipped with a bean catcher underneath. The refined-coarse setting for the coffee is operated by pressing a small button on the collar. Even though Macap MX is a stepless grinder, the compulsory clicking noise while setting the burr position is very spot on, especially when the ground coffee is getting more refined. Image 4: Flat burr. 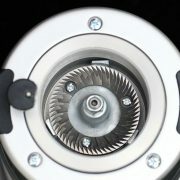 The lower part of the burr is accessible by opening the limiter and turning the knob to the right. You know you have to keep this one particular part clean, don’t you? And using a vacuum cleaner works just fine – I must say, much better than a brush. If we open the bean hopper then we’ll see the flat burr which can be detached by releasing the limiter from the screw on the grinder’s neck (see image below). By turning it clockwise, we can have full access on this most important part of the grinder. 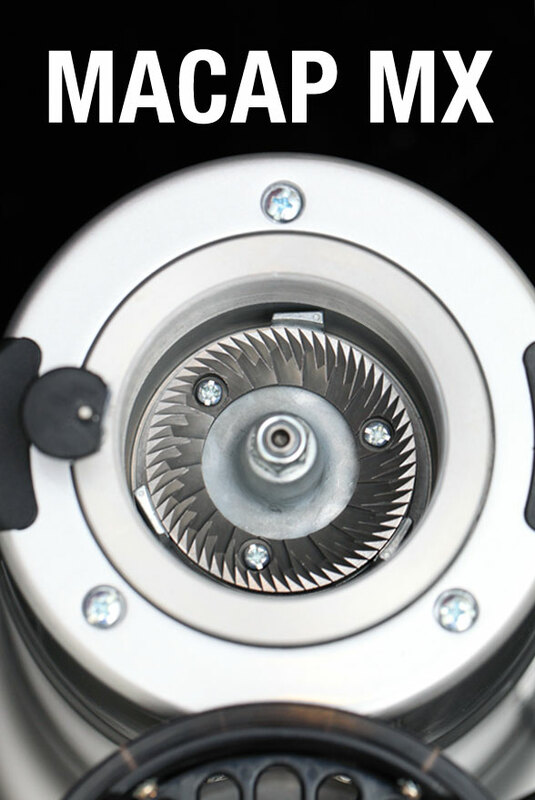 The burr size or the grinder plate comes in 65 mm, only 1 cm different with Hey Café and Anfim (both are 64 mm in diameter), whereas Mazzer Kony is 63 mm burr, and Compak K3/K6 is 58 mm. Doser. 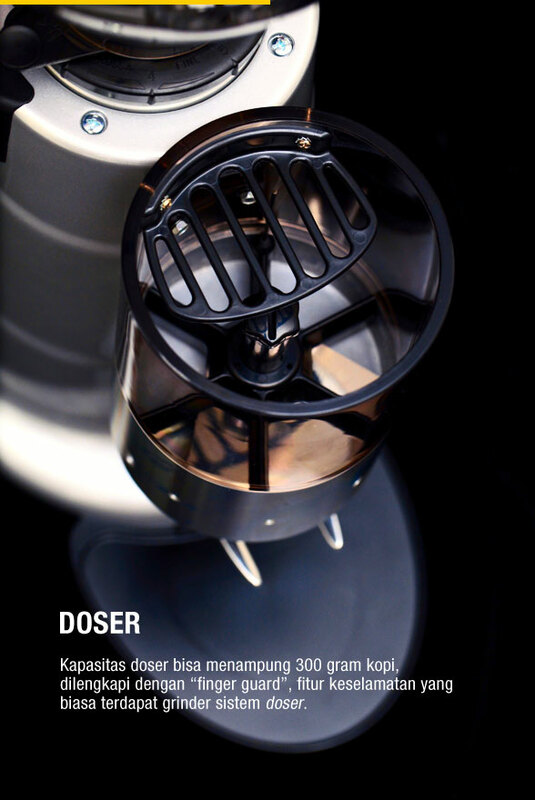 At home, I prefer a doserless grinder solely for practicality and saving my coffee, but no one is going to smack your hands with a ruler if you prefer a grinder equipped with a doser, just like Macap MX, which has a doser that accommodates 300 gram of ground coffee. The outcome can be adjusted by turning the knob located in the middle of the doser (not yet tested). The lever to eject the coffee is pretty soild, but do remember that it’s the part where it can get quite susceptive. I suggest gentle pulling while dosing, because the spring while eventually lose its elasticity until it eventually becomes permanently stretched. Another thing to point out is the finger guard as a safety feature that I find to be quite annoying while cleaning the doser. Yes, I use a vacuum cleaner to clean up, because it’s quicker and much better than a freaking brush! Image 5: 50 – 70 mm. Macap has different burr sizes found on the Macinadosatore type: from 50 mm for M2 type, 58 mm for the M4 and M and 65 mm for the MX (the one shown here), and the biggest one is 75 mm for the M7 900. This is a part of the machine where you tap the porta to distribute the coffee evenly, and it’s made of pretty solid iron material. The gap between the fork and the lower part of the doser is 7 cm – a higher than average length which I usually find on good quality grinders I’ve reviewed in the past. The cable connected to the power source uses a double-pinned system – as per PLN’s (Perusahaan Listrik Negara or National Electricity Company) standard which is 340 watt. Image 6: Bean Hopper. Apart from its capacity to contain 1.4 kg of coffee beans, the bean hopper is equipped with a bean catcher, to make the job of replacing beans easier, and it’s made of solid ABS plastic and has a large capacity, even for a café. I had the honor of trying on this grinder after everything was installed and attached – hence the term “unboxing” – as well as experiencing electricity obstacle and inserting some amount of coffee into the bean hopper. The knob is located on the lower right hand side and it slides to the “ON” position and a low hum from its motor can be heard right away. The chute emitted the ground coffee which was still very coarse, so I had to adjust the burr by sliding it to the more refined setting on the right. It was done by pressing a small button on the neck of the grinder located on the left and this should be done repeatedly until the ground coffee is refined enough for an espresso. Image 7: The capacity of the doser is up to 300 gram, and it is equipped with a finger guard – a safety feature usually found on doser-system grinder. 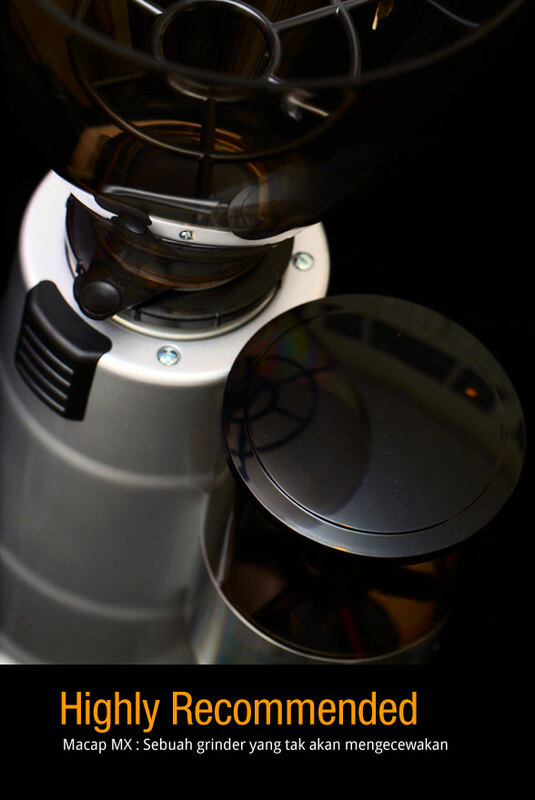 Although I haven’t had the chance to upload the photo of the espresso, Macap MX has already shown its class as a promising, professional grinder. The quality of its material being used is very solid, including the doser, the lever and its porta handle making Macap MX something to be considered. Adjusting the grinder is easy, with clear cut instructions and spinning the burr is quite easy (I found Mazzer’s to be quite difficult to spin). The price is very competitive: Rp. 7.5 million for a stepless, Italian grinder. It’s Macap! Macap rasanya belum terlalu populer di Indonesia, tapi perusahaan yang berlokasi di kota pesiar Venesia Italia sudah punya reputasi sebagai penghasil grinder berkualitas. Perusahaan ini memproduksi berbagai tipe grinder sejak tahun 1930 untuk terutama untuk pasar Eropa dan Amerika dan sekarang kini saya perkenalkan untuk para pembaca sebagai salah satu alat penggiling kopi yang patut diperhitungkan selain nama-nama besar lain yang sudah terlebih dahulu hadir di Indonesia. Permintaan saya kepada pihak distributor PT Sinar Putra Sejahtera untuk mengenalkan Macap akhirnya bisa terlaksana setelah sekian lama menunggu grinder ini datang dari Italia. Maklum perkenalan saya dengan Macap sejak dua tahun lalu membuat kesengsem saat mencoba grinder dengan tipe lain yang di re-branding oleh La Spaziale dengan nama Top Grinder. 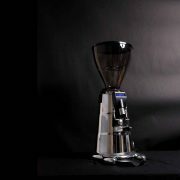 Sama halnya dengan La Spaziale, perusahaan mesin espresso Iberittal juga melakukan penamaan merek untuk grinder yang saya lakukan unboxing ini. Kesan pertama saat dibuka dalam kardusnya Macap MX sudah menunjukan kelasnya sebagai heavy weight grinder dengan berat bersih 13 kilogram. Sayang tidak terdapat manual sebagai bekal untuk mengoperasikan grinder ini, tapi instalasi sebuah alat penggiling kopi tentu tidaklah sulit bukan ? Mari kita kuliti satu persatu bagian integral sebuah penggiling kopi profesional. Macap MX ! Bean Hopper. Saat membuka satu persatu dari kardusnya, pandangan saya langsung tertuju ke arah bean hopper yang menjulang tinggi (25cm) hampir setengah dari badan grinder itu sendiri (58cm). 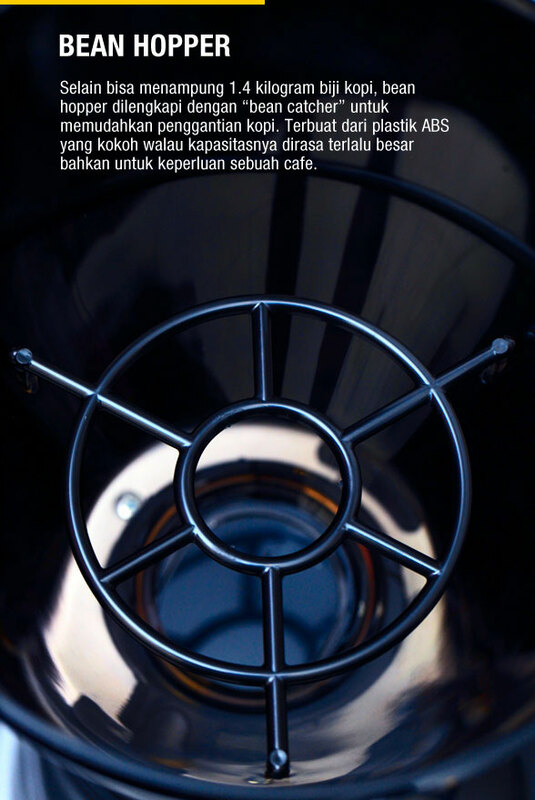 Berbentuk kerucut dengan diameter 23 cm dan berwarna coklat, tempat biji kopi ini bisa menampung 1.4 kilogram kopi yang dilengkapi dengan bean catcher di bagian bawahnya. Grind Adjustment. Pengatur halus-kasar kopi dioperasikan dengan menekan sebuah tombol kecil di bagian collar. Walaupun Macap MX bertipe stepless, namun keharusan adanya bunyi klik yang menandakan posisi burr sudah tepat terutama pada saat bubuk kopi sudah semakin halus. Flat Burr 65 mm. 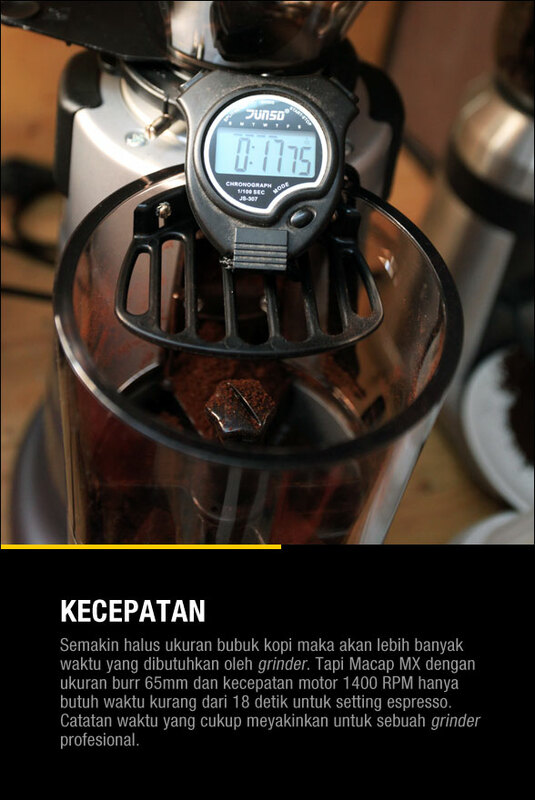 Jika kita membuka bean hopper maka akan terlihat flat burr yang bisa dibuka dengan membebaskan “limiter” sebuah sekrup di bagian leher grinder (lihat foto bawah). Dengan memutar searah jarum jam dengan ulir yang cukup banyak kita bisa mengakses bagian terpenting ini. 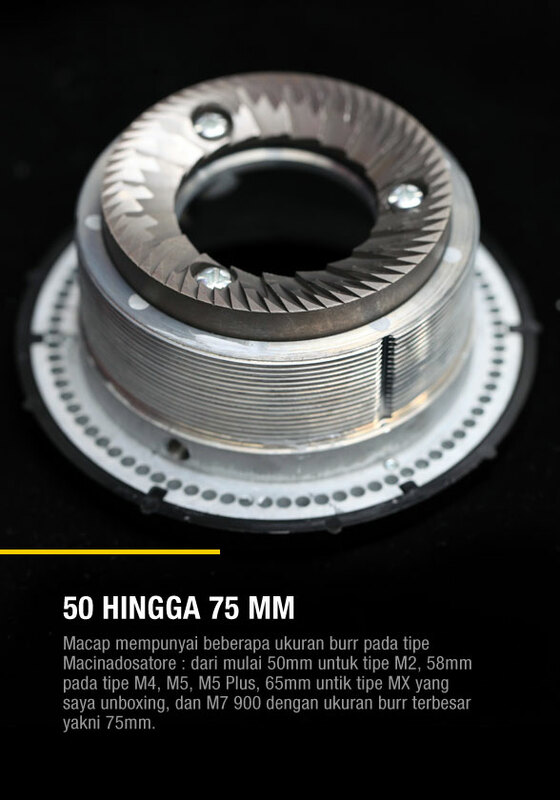 Ukuran burr atau pelat penggilingnya 65mm, hanya berbeda 1 cm dengan Hey Cafe dan Anfim (64mm), sedangkan Mazzer Kony memiliki burr dengan ukuran 63mm, Compak K3/K6 58mm. Doser. Untuk di rumah saya lebih memilih yang tidak dilengkapi doser semata lebih praktis dan hemat kopi, tapi tak haram hukumnya bila lebih memilih yang dilengkapi doser atau penampung bubuk kopi sebagaimana Macap MX dengan kapasitas 300 gram. Keluaran kopi bisa diatur dengan memutar sekrup yang terletak di bagian tengah doser (belum di test). Tuas untuk mengeluarkan kopi cukup solid tapi harap diingat bahwa di sini merupakan bagian yang cukup rentan. 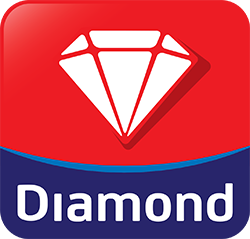 Jadi Anda jangan terlalu bersemangat melakukan dosing dengan menarik tuas sekuat tenaga karena per atau spring lama kelamaan akan hilang elastisitasnya hingga akhirnya tewas. Satu lagi, terdapat finger guard sebagai fitur keselamatan penting yang buat saya justru agak sedikit mengganggu saat akan membersihkan bagian doser. Ya, saya menggunakan alat penyedot debu untuk melakukan bersih-bersih karena lebih cepat dan bersih dibanding dengan kuas. 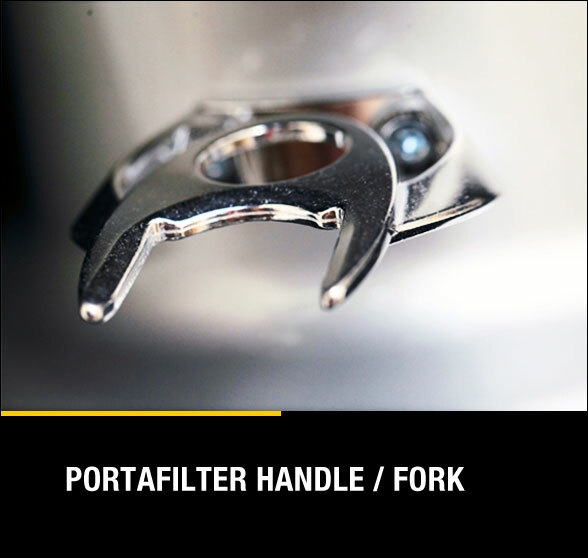 Portafilter Handle atau Fork. Nah ini bagian untuk mengetuk-ngetukan porta agar distribusi kopi merata dengan bahan besi yang cukup kokoh. Jarak antara fork dengan bagian bawah doser adalah 7 cm, standard tinggi yang cukup banyak saya temui pada grinder yang pernah saya ulas. Terakhir, kabel ke sumber listrik menggunakan sistem dua pin sebagaimana standard PLN dengan daya 340 watt. Namanya juga unboxing, jadi saya mendapat kehormatan untuk mencoba grinder ini setelah semuanya siap terpasang termasuk masalah kelistrikan dan sejumah kopi di dalam bean hopper. Tombo putar terletak di bagian bawah kanan langsung digeser ke posisi “ON” dan suara motor cukup halus segera terdengar. Chute langsung mengeluarkan kopi dengan bubuk yang cukup kasar hingga saya harus menyesuaikan burr dengan menggesernya ke arah yang lebih halus ke arah kanan. 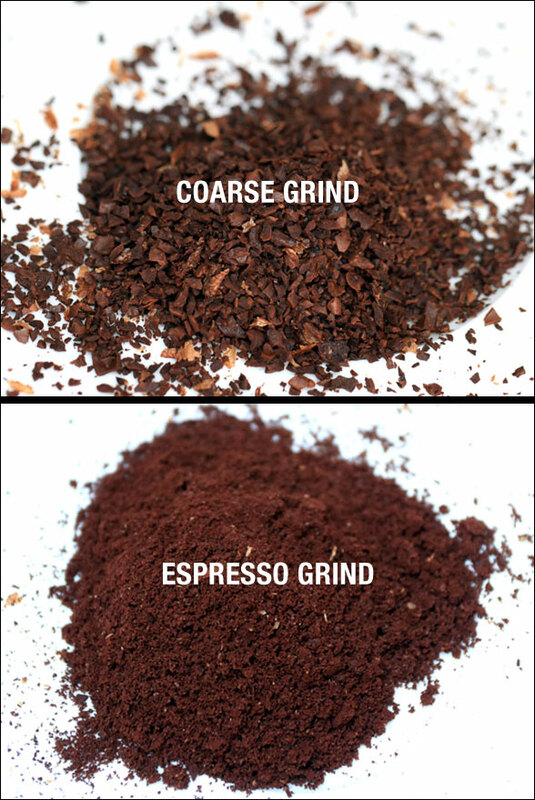 Caranya dengan menekan tombol kecil di bagian leher grinder yang terletak di sebelah kiri dan dilakukan secara berulang hingga ukuran bubuk kopi sudah dirasa pas untuk espresso. Cukup mudah melakukan grind adjustment pada Macap MX dan ini merupakan salah satu kelebihannya. Beberapa ganjalan seperti ukuran bean hopper yang terlalu besar, suara klik, semoga tidak terlalu mengganggu sebuah penggiling kopi yang akan menemani saya selama beberapa minggu ke depan. 15 May 2012 : Setelah sekian waktu saya mencoba Macap MX, cukup dengan sebuah kesimpulan : highly recommended ! Kinerja yang tak mengecewakan melebihi harganya. 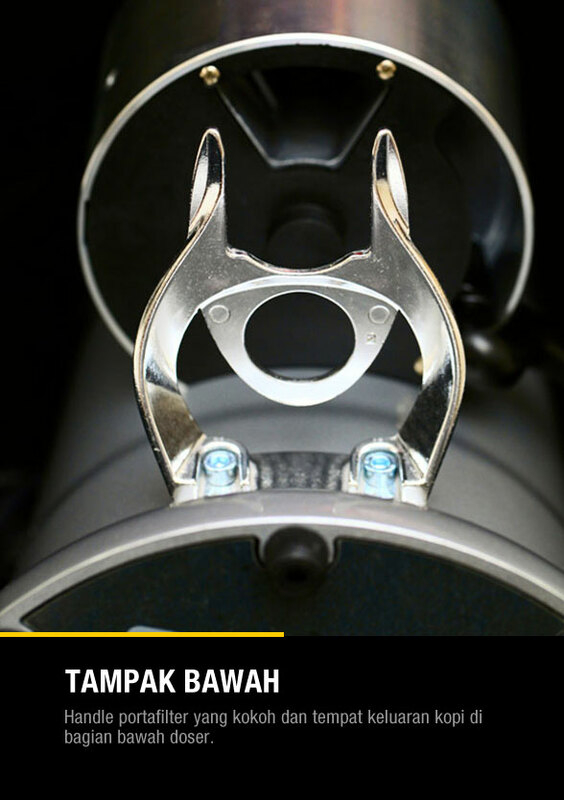 Kualitas material yang digunakan yang membuatnya begitu kokoh, termasuk bagian doser, lever, serta porta handle membuat Macap MX sangat layak dipertimbangkan. 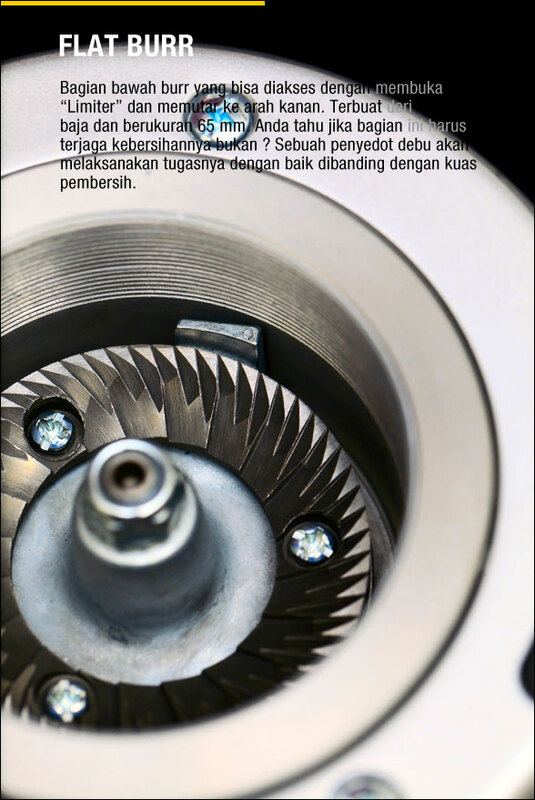 Harga yang sangat kompetitif : 7.5 juta rupiah untuk sebuah grinder stepless buatan Italia. It’s Macap ! Macap MX ini jika sering digunakan untuk french press & eapresso, apakah pengaturan grind adjusment cukup mudah & kuat pak Toni ? dan untuk memberaihkan sisa2 kopi apakah mudah ?